I was diagnosed with acute bronchitis on November 27. After symptoms developing the Wednesday before, I had a miserable Thanksgiving! Headache, muscle aches, low grade fever, lots of sputum, nasal congestion (which turned from clear to yellow), shortness of breath which scared me the most, and coughing big time. I ended up on 4 different medicines...antibiotics, steroids, inhaler, and a heavy duty Motrin. I was a smoker. I made a vow this past Sunday that I will not ever touch another one. This has really kicked me in the behind! But, I do feel much better today after starting my medicines. I have had this hacking cough for 4 weeks now. I felt too ill to go to surgery, so doctor came to me. I had fevers and ached all over, and headache and sore eyes. He gave me penicillin and steroids. It damped things down a bit but the wheezy cough was still bad. I rang out-of-hours doctor, told him doxycycline had worked for bronchitis in the past. I have been taking it for 3 days now and still have thick mucus on chest, sometimes white sometimes yellow! I still feel really tired all the time and unwell. Life feels like it is going by without me, I can't wait to feel well again! I thought it was a cold. I was coughing with very bad of phlegm. After 2 weeks I went to my doctor. She gave me antibiotic and prescription cough medicine. Well, the cough medicines didn't stop cough, but made me get up the phlegm. Well, it is worse in the night. Every night I cough for about 1 hour before I fall asleep. I get up to go to the bathroom and then am coughing again for about half hour till I fall asleep. It has been 5 weeks today, I just wish it would stop. I had this last year and it is awful. My conclusion is it is bronchitis. Doctor said my lungs are filled with phlegm. I don't wish this on any one, it drains you. I had an upper respiratory episode (with persistent cough) in April, which was treated and went away. The 3rd week of July I developed bronchitis problems again. This time, coughing (severe at times) producing mucus, upper respiratory and chest congestion; no fever. The mucus and cough have continued and this is October 7. I have seen my primary, ENT, and pulmonology specialist. I have had x-ray, mucus infection test (negative), nebulizer treatment, and inhalers. The symptoms seem to improve some, but will not go away. I have a breathing test this week. I am on Singulair, Mucinex, nasal spray, Equate, Delsym, and other medicines. My dermatologist took me off Otezla (for psoriasis) as it sometimes causes these side effects. I have seen a small change in symptoms but still going on. Honestly, I do not know what is wrong with me and apparently neither do my doctors. I will have to see how the breathing test and absence of Otezla goes. I get acute bronchitis when the flu is going around or whatever is going around. I always end up with bronchitis. This time it was brought on with inhaling (not on purpose) propane in a warehouse. My chest felt heavy like I needed an inhaler. The next couple of days I wasn't feeling well. I felt tired and was coughing. No temperature, a slight sore throat. I was not really having a problem breathing at first. My throat was burning; I thought I had strep throat. I had pain in my neck, and there was swelling around my collar bone. The first doctor I went to said he did not know why there was swelling. He gave me antibiotics and told me that if the swelling was not better to come back in three weeks and I went back after three weeks he diagnosed me of COPD and told me there was no cure. Acute bronchitis is contagious. The next question arises as to how long bronchitis is contagious. The answer to this is it can last for as little as a few days to three weeks, and will often follow a viral infection like the flu or cold. 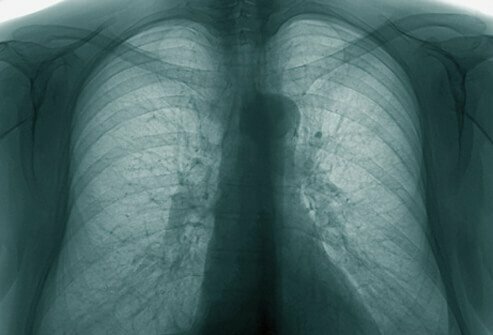 Acute bronchitis is more severe than an average cold, but not as serious as pneumonia. I started out with a sore throat, then the dry coughing. I saw my doctor first week, and went on antibiotics. Second week I went to see my doctor as I had a lot of fluid behind my ears. Third week I was feeling a little better, then I started going downhill again. I went to a walk in clinic found out I had bronchitis and an ear infection. He gave me 2 different type of puffers, and eardrops. Fourth week I was feeling worse. I made another trip to my doctor, where she said I had acute bronchitis and put me on prednisone. But I cannot seem to get rid of this cough and it is very nerve wracking to say the least. I am tired all the time because I can't sleep, and I have missed 2 weeks plus of work. I just want my life back. I drink lots of water and tea. I have found actually that nothing over the counter has helped me and neither does it seem, have the prescriptions from the doctor. Thanks for listening, no I am not much help to anyone, but this is what I have gone through. I started out with a slight runny nose and thought it was allergies or sinus. This continued for a week and slowly started to feel like my lungs were being affected. I then started to experience a dry cough which continued to get worse daily and sleep was out of the question. I resorted to sitting up in a chair and trying to sleep. I am unable to get any mucus up and coughing is severe. I went to the doctor and took a breathing treatment along with getting prescriptions for a Z-Pak and inhaler for bronchitis. I have coughed so much my stomach and side muscles are extremely sore. I have almost constant, violent coughing with wheezing or rattling in my chest. I cough so hard to get the mucous up but it wears me down trying. I am on 4 medicines including an inhaler, Z-Pak, prednisone and cough syrup. I can"t sleep. This bronchitis really wears you down and I"m only into day 3. I am not a smoker but very high pollen counts here in Charleston, South Carolina. I am hoping for a little rain to clear the air. I hope this helps someone who has this. Get up as much as you can. Drink a lot of fluids. Hot tea with a little lemon and honey seems to help. My acute bronchitis started with a sudden onset of sore throat, difficulty in swallowing and just feeling punky. The annoying coughing soon followed while everything else continued, with a low grade fever too. By day 4 to 5 a visit to the doctors was needed to rule out strep throat. I continued with treatment for each symptom. The barking cough with phlegm, was going nowhere but the painful sore throat did subside after about 7 days. Getting sleep at night was number one priority. With cough medicine, cough suppressant, inhalers and lozenges, slowly improvement is seen. I came down with bronchitis two weeks ago. I have been given an injection of prednisone, a five day dose by mouth of prednisone, numerous treatments of albuterol and two 5 mg doses of prednisone in an emergency room on Friday. I am still ill.